ALPS Mountaineering Chaos 3 Tent Review - From $188.49! Alps Mountaineering Chaos 3 is a three season tent that is lightweight and super durable, it’s cheap and oh yeah, it also very spacious and light too! The unique design of the Chaos 3 has been specially tested to resist rainy and windy conditions. It also offers extra “guy-outs” which give it even more stability in bad weather. You will not be disappointed by the space either, it fits three people easily. This is a great tent with lots of space that will not fall down. This is one of the biggest tents on the market at 41 square feet, three people plus all their gear is absolutely easy for this tent to store. The vestibule area itself is 22 square feet which is incredible considering that that space is just used for storage. The center height is 3 ft 8 inches which is one of the taller tents on the market but it cannot be too high otherwise the weather resistance aspects of the tent will be taken out of the equation. 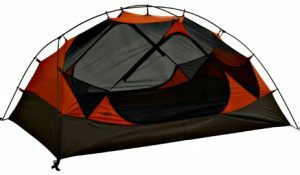 Alps Chaos 3 tent uses a shock corded pole system that is linked continuously making it extremely unique and ultra effective when it comes to resisting all types of weather. Additionally it uses a multi pass-urethane coating that covers from floor to fly which gives it the maximum weather protection available. The walls on this tent are made out of taffeta making them one of the most secure ones on the market. The easy to assemble design of this tent is also coupled with secure tent clips that on other models we have found break very easily. That is not an issue with this model. They stay attached no matter what! The Chaos 3 tent also includes factory seams for the fly walls and floors, no water is getting inside and these will never need repairing. The aluminum poles are lightweight and strong, it really is the best material around. Lastly like with all ALP’s tents #8 zippers are used are included to make it a swift and smooth job opening and closing the flaps and doors. Alps Mountaineering Chaos 3 tent is a large and also lightweight and strong. It is good in all weather conditions and can be erected very quickly. This tent is one of the best large tents around. It’s large and spacious design mean that if you are caught in bad weather for a considerable amount of time you will not go too “stir crazy”. It’s also relatively lightweight so moving around with it in your pack for extended periods of time should not be much of a trouble. It is one of the best 3 person tent available on the market. This tent again uses your basic ALP’s format, with well suited earth tones. With a copper/rust outer layer over the walls and grey roofing fly it comes together nicely and suits the tent well. One change that you will notice about the Chaos line in relation to the aluminum poles is that they are black instead of orange these black poles are a sign of the continuous frame system at work. Continuous frame system on a big tent is impressive. A little on the heavy side over long distances. Fly roof has be attached otherwise you are at the mercy of the weather being on your side. Ultimately alps mountaineering chaos 3 review is; this tent is huge, but it is also very tough and can handle most weather and terrain situations you throw at it. It has great space and storage facilities inside you just need to be sure to put the fly out up when you are leaving camp so you don’t come back to find all your material wet inside. Thanks for reading alps chaos 3 review here! !